Saturday February 7- 1931 I went to the hospital by Taxi. The Dr took the measure for in-soles for shoes. I was given a massage treatment. Mary & [Ilo] brought me home I got me some dinner. Did some washing went over the house at three oclock to Hatties by Taxi. Rob brought me home at 8.30 Letters from Mattie Fletcher & Edith W- wrote Winnie Sunday February 8- 1931 Ott took me to church. 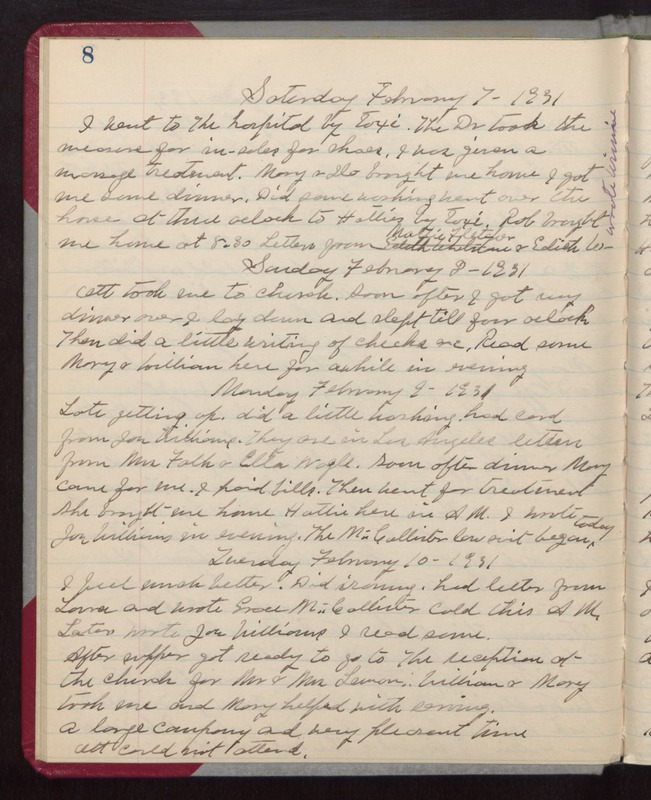 Soon after I got my dinner over I lay down and slept till four oclock Then did a little writing of checks &c. Read some Mary & William here for awhile in evening Monday February 9- 1931 Late getting up. did a little washing. had card from Joe Williams. They are in Los Angeles letters from Mrs Falk & Ella Nagle. Soon after dinner Mary came for me. I paid bills. Then went for treatment She brought me home Hattie here in A M. I wrote Joe Williams in evening. The McCallister law suit began today Tuesday February 10- 1931 I feel much better. Did ironing. had letter from Laura and wrote Grace McCallister Cold this A M. Later wrote Joe Williams I read some. After supper got ready to go to The reception at the church for Mr & Mrs Lemon. William & Mary took me and Mary helped with serving. A large company and very pleasant time Ott could not attend.